Background: St Martin was born in Lima, Peru. He was the illegitimate son of a nobleman and possibly an African slave. He grew up in poverty and devoted his life to the care of the poor and prayer. As a Lay Brother he begged daily for alms to feed numerous poor. He received extraordinary gifts: light filling the room where he prayed, appearing in two locations at the same time, miraculous knowledge, instant cures and remarkable rapport with animals. His Feast Day is 3rd November. 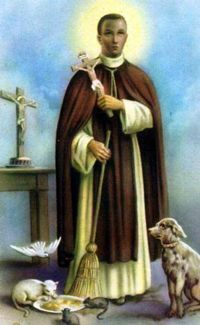 Saint Martin de Porres, your concern and charity embraced not only your needy brethren, but also the animals of the field. You were a splendid example of charity; we thank and praise you. By modelling our lives after yours and imitating your virtues, may we live content knowing that God has looked favourably upon us. Help us to accept our burdens with strength and courage in order to follow in the footsteps of our Lord and the Blessed Mother Mary. Guide us in our struggles to reach the Kingdom of Heaven, through the intercession of our Lord Jesus Christ. Amen.